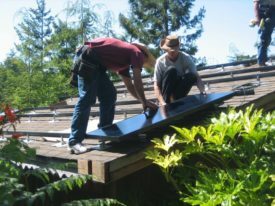 Mendocino Solar Service » Reassurance about the effect of PG&E Bankruptcy on the solar industry. Reassurance about the effect of PG&E Bankruptcy on the solar industry. This morning PG&E announced its intention to file for Chapter 11 bankruptcy protection by the end of the month. Members have been contacting us with questions about how this development could affect current and future solar and storage projects. There are several potential impacts that we have identified, but broadly speaking, we do not anticipate a significant impact on the solar and storage market in PG&E territory. The programs that affect solar and storage customers operate under state law and CPUC decisions that remain in force regardless of PG&E’s bankruptcy status. Below we respond to specific questions we’ve received. Of course, all this said, the bankruptcy of the state’s largest utility is no small matter and ultimately will impact all of our advocacy and programmatic work going forward. This development will create both challenges and opportunities for the distributed energy community. We will share more of our thoughts on the bigger context to this bankruptcy news in the days and weeks ahead. How will this affect net energy metering or net surplus compensation? We do not see any potential impact to NEM or NSC for existing or future solar installations. PG&E has an obligation under state law and CPUC decisions to continue calculating customers’ credits under the approved NEM and NSC formulas. Similarly, PG&E is required to continue offering the NEM successor tariff and to make NSC payments to solar customers. PG&E’s bankruptcy status will not affect PG&E’s NEM and NSC commitments under state law. Could PG&E suspend SGIP incentive payments? Because the funds used for the incentives and the administration of SGIP are collected by a separate adder on utility bills and the funds are reserved under state law for the purposes of SGIP, we do not foresee any impact on the program. Suspension of the program would not help PG&E cover any of its general debt obligations because PG&E cannot redirect SGIP funds for that use. It is possible that staffing of the program could be affected, which may delay processing of SGIP documentation and incentive payments, but this is entirely speculative. “Are existing contracts for demand response, renewable energy, and other grid services at risk? Sign Up for the MSS E-News! Meet Bruce, Maggie, John, Jason, Jez, and the rest of our team. We all live, work, and play in the local community. Visit our Staff page and get to know the folks who can provide renewable energy for your home or business!